Supports USB3.0 interface of desktop or laptop. This USB to HDMI adapter can connect a computer via USB interface to an HDTV, monitor, or projector with HDMI interface. Support: can support or extend the image picture, maximum support 1080P resolution HD audio and video signals. COMPATIBLE DEVICES: Compatible with iPhone 7 series，iPhone 6 series, iPhone 5 series, iPad Air, iPad mini, iPad PRO, iPod touch (5th generation). Note: this cable can't compatible with IOS 11! Trust for IOS. New Mini HDMI To AV Adapter Converter with USB Cable. Convert analog signal( VGA ) to digital signal ( HDMI ). The audio is coupled with the VGA video signal, then audio and video are both converted to HDMI format. Important Note: converter is NOT bi-directional. 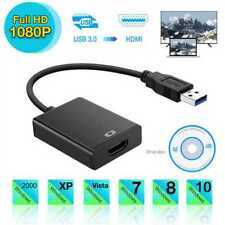 USB 3.0 to HDMI External Video Graphic Card Adapter Converter. USB3.0 to HDMI provides high throughput using the USB3.0 bus and supports the High definition monitors with high resolution and high refresh rate. Female HDMI to Male AV RCA Converter Adapte. r Composite Audio Video Converter USB. HDMI Input Resolution: 640x480@60Hz, 800x600@60Hz. Output ports: 1 RCA(Yellow,White,Red). AV/RCA output : TV / Projector / Monitor / Sound. 1 x Black Type-C to HDMI Converter. Compatible devices with Type-C ports.